Miracle Source Hemp Protein Powder is gluten, dairy and lactose free. It contains no preservatives or additives. Our hemp based protein powder is a great alternative to non-hemp protein supplements, and our protein powder is an excellent source of raw, plant derived protein at over 50% and beneficial dietary fiber low in net carbs. Use our hemp protein powder in place of all other protein supplements to ensure your body receives an adequate protein influx each day to repair and maintain muscle tissue. Mix our hemp protein powder generously into juices, shakes or smoothies. Sprinkle on soups, yogurt, cereals, salads or fresh fruit. Recommended daily intake: 4 to 6 tbsp (60g / 2.17oz) up to 4 times per day. Use hemp protein powder for muscle building and quicker weight loss. Add 4-6 tablespoons of protein powder to water and blend. Add fresh fruit for more natural flavour. Some people will alternate the hemp protein powder with the shelled or hulled hemp seed from day to day. This technique works well for some people as they still receive all the nutrients from the hemp seed every other day but reap the benefits of quicker weight loss by tricking the body into thinking it must burn fat to survive. You can have several hemp protein shakes per day with your daily diet and right after exercise or workouts too. 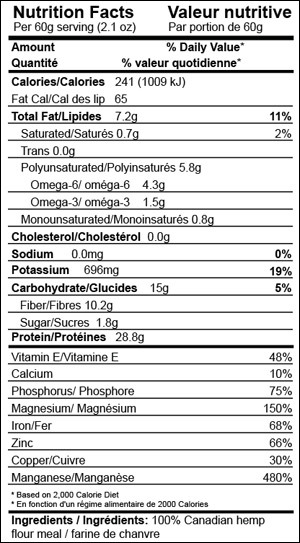 The nutritional composition of hemp seed protein powder is incredible! In it’s perfect organic natural state hemp seed protein is considered by many to be the safest, most digestible, balanced, natural and complete source of protein found anywhere in nature. Hemp protein is also a complete source of all 20 known amino acids including the 9 essential amino acids (EAAs) which our bodies cannot produce. Approximately 65% of the protein in hemp seed is made up of the globulin protein Edestin and is found only in hemp seed. Edestin aids digestion, is relatively phosphorus-free and considered the backbone of the cell’s DNA. The other one third of hemp seed protein is Albumin, another high quality globulin protein similar to that found in egg whites. Hemp protein is free of the tryspin inhibitors which block protein absorption and free of oligosaccharides found in soy, which cause stomach upset and gas. Hemp protein also provides an excellent supply of antioxidants (Vitamin E), carotene (precursor to Vitamin A), phytosterols, phospholipids and a number of minerals including calcium, magnesium, sulfur, potassium, phosphorus, along with modest amounts of iron and zinc. Hemp seed also provides a good source of chlorophyll. Miracle Source hemp hearts and hulled hemp seeds and the hemp seed used in our protein powder are derived from the highest quality seeds available. All our seeds, both conventional and certified organic hemp seeds are grown in Canada without the use of herbicides or pesticides. They are also Non-GMO, Gluten-free, Peanut free, THC and Tryspin Inhibitor free, Vegetarian approved and Kosher certified.